Ah, train games. Seems that every other post I am talking about one of the greatest theme for board games, trains, and everything they seem to encompass. Be they simple games like Ticket to Ride or Union Pacific, slightly more complex games like Russian Railroads or Locomotive Werks or the big guns like Age of Steam, 1880, 1817 and all other 18XX. All these games have the same core, the iron horse, but all feel quite different in the way they represent their subject. They all have a different focus and level of complexity, and in the end, they are all lovely games for different reasons. There has been many attempts at bringing dice to train games. Some have been successful or at least interesting (Railroad Dice) and other seem to have missed the mark (Railways Express). After Quarriors, which innovated with a dice building game, Wizkids stepped up to the plate once more and delivered a train-themed dice game, Trains & Stations. Any good? Let’s find out, shall we? In Trains & Stations (Wizkids) by Eric M. Lang, the players take on the roles of rail barons, creating rail lines between cities, building different types of buildings that will net them Goods cards, all in an attempt to score more victory points than their opponents. They will do this using dice, which will either be exchanged for buildings or placed on the map to create rail links. The game ends when the deck of victory points cards is exhausted, after which Goods majority is established, scoring extra victory points. 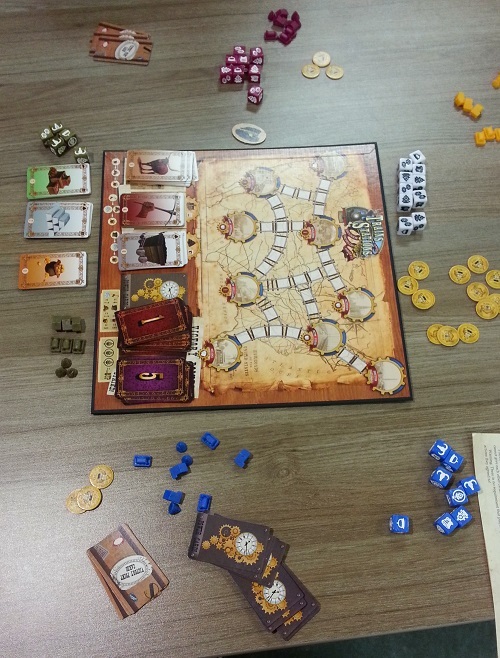 The game is short, lasting roughly 30 to 45 minutes with up to 5 players. Like most Wizkids games, the components for this game are gorgeous, if a little on the small size. The game comes with a single panel board, which is the same size as the box and the top third of which is the map, with the bottom being spaces to place the cards. While everything is clear enough, it makes for a very small playing surface. The game also includes 50 dice in 5 player colors plus white neutral bonus dices. Also in the box are three sets of cards: Goods, Power and VP cards. There’s also a nice set of plastic buildings, again in each player colors. Money token as well as a first player token round out the package. Like the map, the game components, while very nicely done, all feel small to me. Everything could have easily been scaled up by at least 50% and I don’t think anyone would have complained about the price. Instead, players are grumbling about the size of everything (or enjoy feeling like giants) unless you’re playing with small children. The worse of all the components is the small, circular pyramid that is used for the Mines player tokens. They are almost impossible to grab. The rulebook is short and clear enough even if we had some questions during the game. Not the worse ruleset I’ve had the pleasure to meet, but not the best either. Set up is very simple: hand each player the 8 dice in their color, along with the buildings, 3 coins and three 1 VP cards. Removing some cards from the VP card stack, according to the number of players. Divide the Goods cards by type, placing the Cattle, Workers and Coal cards on their respective spaces. Shuffle the Power cards, dealing 3 to each players. Players will keep 2 of the 3, discarding the extra card. Choose a starting player and you’re ready to go. Place the dice, potentially triggering connections between cities. 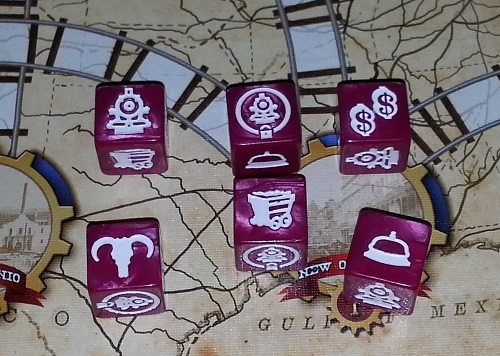 The dice, both player dice and bonus dice, have 6 different icons printed on their faces: 3 that represent types of Buildings (Ranches, Mines, and Hotels), 1 for 2 Coins, and 2 that will be used to lay tracks (Train and Locked Train). On their turn, a player takes 5 of their dice and can add as many bonus dice they may have accumulated as they wish. If they have less than 5 of their dice left, they must use any bonus dice to bring up their total to 5. Players get one roll for free: if they wish to re-roll any of their non-Locked Train dice, they must pay 1 coin for that re-roll (not 1 coin per dice, but 1 coin for the complete re-roll). Note that if 3 Locked Trains are rolled, a “Strike!” happened and the player can no longer re-roll even if they have coins and they lose 3 VP. Once the player is happy with his roll or unwilling/unable to pay for more re-roll, they will lay down tracks by simply placing any die showing either a Train or a Locked Train on an empty space on the board. Then, if the player has 3 dice showing the same building, they may place a building of that type onto a city, providing that there is an empty building slot and that all cities have at least 1 building if this would be the 2nd building for that city, or all cities have at least 2 buildings if this would be the 3rd building. The player may choose to cash in any dice showing Coins, gaining 2 coins for each such die. Player can only have 5 coins at any given time however. Any dice showing either a building or coins can be saved for the next turn, reducing the number of dice that the player will then roll. If all the spaces between two (or more) cities are filled, these cities will now be scored. Every player who has dice in those connection, ignoring bonus dice, will score 1 point per city connected. The player who has the most dice in a connection will also collect the bonus of each city: either a bonus (white) die, Power cards or extra VPs. Once all scoring is complete, all the dice are removed and returned to their owner. 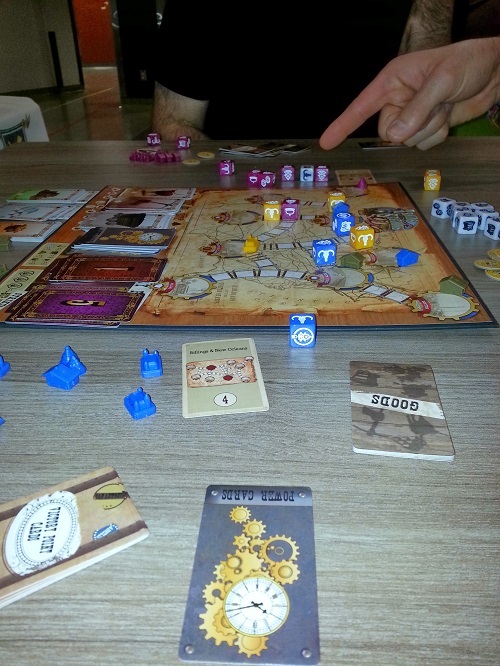 When a connection between cities is scored, players who have buildings on the connected cities take Goods cards from the corresponding stacks, getting a VP card if the stack was empty. A neat twist to this mechanic is that one stack can be upgraded if it is empty at the end of the turn (if there are multiple empty stacks, the current player gets to choose which stack gets upgraded, same if there are not enough cards remaining to give to all players who should be collecting Goods cards). The possible upgrades are dictated by the game, with one building type, the Hotel, upgradable to one of two new Goods type. There is some interesting choices there as the point values for the Goods does increase. When a Goods is upgraded, all players can trade in any goods at a 2:1 ratio to upgrade to the new Goods, allowing for a “gold rush” effect on this new, more valuable Goods. This is done simultaneously, with all Goods traded being kept secret until everyone reveals them. Power cards are actually quite simple: they are either multiple Goods cards (counting for EACH type of Goods on the card) or destination cards like in Ticket to Ride. If the two cities mentioned on the cards are connected at the end of a player’s turn, the player simply reveals the card to score the points. Simple enough, but depending on the cities, it can take some finagling to get the harder ones scored. The game ends when the deck of VP cards runs out, with each player getting one more go. End of game scoring is a simple majority of the various Goods cards (plus any bonus Power cards). Check for who has the majority in each Goods type and give them the points indicated by the cards. Only the player who has the most gets points, there are no second or third places. In case of ties, all tied players get the same amount of points. One thing Trains & Stations has going for it is the ease of play and the length of the game. As stated above, it is fairly simple to explain and most games will be over in roughly 30 to 45 minutes. As such, it doesn’t really overstay its welcome. But in there lies the problem. The game is fast and simple, but you quickly see what seems like the one winning strategy: don’t pay attention to the buildings unless you don’t want to pay for re-rolls. Building tracks is always more cost-efficient (you get at least two points right then, instead of potentially getting 4 to 9 points at the end of the game). There are some runs that, if lucky, you can get an easy 4 points in one turn. Making deals with another player can easily get you 4 or 5 points, so why go for the Goods? If everyone follows that strategy, the game devolves into a giant game of luck, with whomever rolls the most Trains having a major advantage, forcing the other players to make deals. The decision space is unfortunately quite small: roll your dice and, if you happen to have some coins, maybe re-roll some of them. Most of the time, if not almost always, you’ll be looking for Trains, although Locked Trains are ok, if more of a pain to deal with. Since almost half of the rail connections are made up of 3 or less dice, it’s usually a gimme to go for the quick 2 points. You might want to push things a little by placing your dice on a few different lines in an attempt to entice other players to close the lines for you, but there is absolutely nothing stopping you from using the Boston/New York (a 2 dice line) the whole game to get 2 points each turn. Compare that with attempting to get the majority in any types of goods, where you’ll have to get 3 of any type first, and then make sure that that specific city is used as often as possible, to possibly net you 4 to 9 points at the end of the game. I guarantee you that you’ll be making many more points if you ignore the buildings. Is there a better way to give points for the Goods than a single majority at the end of the game? Probably, for example by giving points for majority and collecting sets. It would encourage players to use the buildings more and perhaps build more tension for the end of the game. It would certainly slow down the game a certain amount instead of having a race to grab as many victory point cards as possible, pushing the game faster towards the end (the game ends when there are no VP cards left). I’m really unsure what strategies that Eric Lang wanted the players to explore. There are certainly some interesting mechanics, with the push-your-luck “Strike!” mechanic at the forefront, but they feel let down by the scoring system. And at the end of the day, it doesn’t matter how cool your mechanics are if the players are not encouraged to use them. I like this game on the surface, or at least I really want to like this game, but the more I think about it, the more the way the scoring is structured really bugs me. While I can accept that you can get lucky on a roll (that’s the nature of dice, after all), having your entire strategy based on “Go for coins or for trains” is kind of boring. Even when you go one level higher and start making alliances with other players to maximize placement, you still depend on what you’ve rolled. Seeing that most players will stop going for good quickly, thus making that whole side of the game moot, it makes the game too single focused. Too bad. We can really use another simple train game, but this is perhaps not it. The only way I can recommend this game is as a fast, brainless filler at the start of the evening, but even there, as there are much better fillers out there. This entry was posted in Review and tagged review, trains and stations on January 31, 2014 by TopDog.